This educational poster features an original illustration of former U.S. 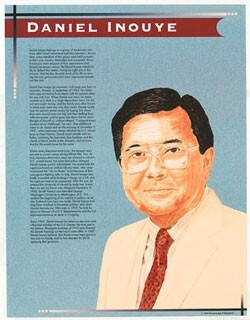 Senator Daniel Inouye, as well as substantial biographical text. 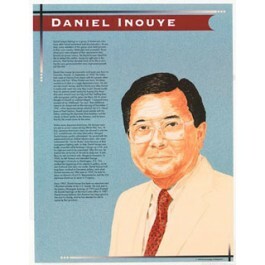 Daniel Inouye was born in 1924 in Hawaii to Japanese-American parents. Like many Japanese-Americans, he experienced discrimination especially during World War Two. But that did not stop him from signing up with the all Japanese-American 442nd infantry. After the war he went to law school and became interested in politics. In 1959, when Hawaii became a state, he became its first U.S. representative, and the first Japanese-American to serve in Congress. In 1962, he became a senator and remained there until his death in 2012. This poster is a great way to introduce students to a great and dedicated American who overcame discrimination to become one of the most powerful figures in government.